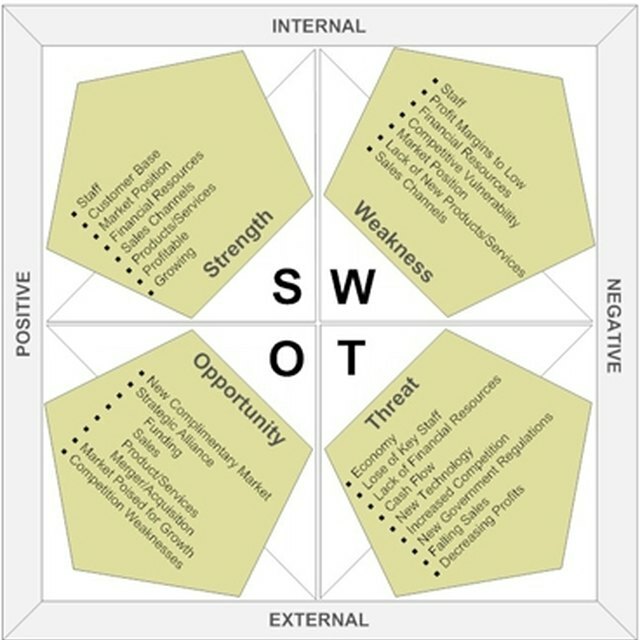 Each element of the organization’s mission and strategic plan should have a separate SWOT analysis. Therefore, under the strengths label, your team should identify the positive factors associated with the element being examined. For example, the nonprofit might offer a new, innovative product or service, or it might have an extensive network through which it can share resources and communicate about its services. Other strengths can include its location, its funder base and its expertise. Many larger nonprofits also enjoy a long history which affords them a good, solid reputation in their communities. These strengths can be harnessed to execute new plans for the nonprofit’s future. Remember to focus on internal deficits that make up weaknesses in a nonprofit SWOT analysis. Typical weaknesses include small staffs and scant resources. If a nonprofit wants to deliver services to 100,000 people as part of its strategic plan, weaknesses like these need to be considered. Other less noticeable weaknesses include being not so unique, a board that has little resource development experience, and an unclear mission. In addition, having had bad press or any recent damage to reputation can be a severe weakness that is hard to overcome. The strategic thinkers must do an environmental scan and begin looking outside for the factors that help and hurt its chances of successfully implementing its plans. Opportunities can be developed by doing a needs assessment of the community or population your nonprofit serves. Are there emerging needs that no other nonprofits are fulfilling? For example, many nonprofits found niches in assisting families with rising unemployment and foreclosures in the recent economic downturn. Likewise, others have filled the spaces left by nonprofits that also faltered in the economy. Even in a saturated nonprofit market, opportunity lies in joining forces. If you merge or form an alliance with like-minded organizations, the banded effort could reach more people and share the funding. Just because they don’t operate to produce a profit doesn’t mean nonprofits don’t have competitors. Threats that nonprofits typically encounter include very large nonprofits expanding into their base service areas and other nonprofits producing the same services. In addition, foundations frequently cut back on funding or change their own priorities. Donors also experience “fatigue” and stop giving, or give a smaller amount. The goal of SWOT analysis is to help nonprofits produce an action plan to support what works, change what doesn't, seize on opportunities and minimize the threats to its operations. It will be almost impossible to have staying power in today's competitive funding environment without conducting this type of assessment at regular intervals, usually about five years. Inherent to nonprofit operations is a constant tug-of-war between its mission and what it has the capacity to do based on its resources and environment. SWOT analyses clarify strategic plans and offer directions for the future. Still there are important issues that govern nonprofits that must be considered in SWOTs, including how plans align with mission, budget constraints, competitive position, programming and communications capacity, and funding and resource maximization. Idealist: "What is a Strategic Plan?" University of Wisconsin-Extension: "SWOT Analysis — A Facilitation Tool for Identifying Strategic Issues"
Rapid BI: "How to Do a SWOT Analysis"
Free Management Library: "Strategic Planning (in nonprofit or for-profit organizations)"
Virtual Strategist: "SWOT Analysis: How to Perform One for Your Organization"